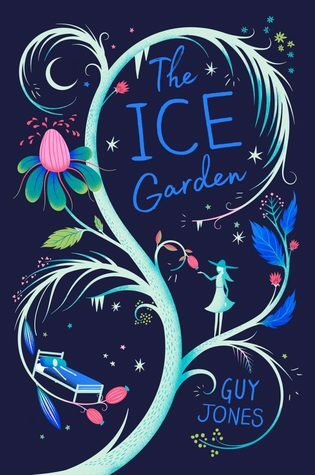 The Ice Garden, by Guy Jones (Chicken House, January 2019 in the US), is the story of a lonely girl who finds her way through magic to a frozen garden, a friend, and a terrible choice. Jess is allergic to the sun, and so her mother keeps her safely, vigilantly working to protect her daughter, which means keeping her inside almost all the time, and letting her go outside only when shrouded against all possible touch of the sun. So Jess has no friends, and her only escape is in writing stories. One night she rebels, and walks out of the house unprotected...and finds herself entering a night-time garden all made of ice. It is a beautiful, magical place, and there Jess finds a friend, a strange boy named Owen. Owen is not communicative about the garden, though he does hint that there's a dark side to it's beauty. And Jess is so delighted both to be outside and to have a friend that the whispers of darkness are irrelevant. In the meantime, her hospital visits become more interesting when she starts sneaking into the room of a boy in a coma to tell him stories. One thing bothered me about the book, Jess's mother seems almost pathological in her protectiveness....it seems like she could have given her daughter more semblance of a normal life, but instead infantilizes her, calling her "little one" all the time. So Jess has almost no agency, which is why sneaking out of the house at night is so important to her. In the last conversation between Jess and her mother in the book, though, the mother makes Jess promise never ever to do such a thing again, and it's like she wants to trap her daughter forever (quite possibly I'm reading too much into it...but that's how I felt). The ice-garden is a lovely, magical bit of wonder, such as will delight the young reader who loves beautifully described impossible places. Jess's friendship with Owen also makes for good reading, and I didn't actually mind the magical healing/unhealing part of the end. I also wasn't bothered by the complete lack of explanation for the magic; I went as far as to ask myself if I should be, but decided not to be. Sometimes ice gardens happen.